For all of the hullabaloo its generated with its tiny consoles, Nintendo didn’t invent retro gaming consoles. Not by a mile. When it released the NES Classic late last year, Nintendo wasn’t creating a new field of consoles fueled by nostalgia and the fat wallets of aging Gen Xers. Rather, Nintendo was reinventing the retro console, which has long existed as a series of crummy knock-offs sold behind the counter at drug stores and in the back of your local Bed Bath and Beyond. AT Games was one of the purveyors of those crummy consoles—churning out Sega Genesis and Atari 2600 clones that cost next to nothing and often times felt like they played even less. Atari and Sega emulators packaged to look like the original consoles. The Atari 2600 console is great. The Sega Genesis console is not great. So when Nintendo launched the NES Classic, what it was doing was giving those other retro console makers a kick in the pants, and showing companies like AT Games what the hell it should be doing with those giant libraries of thirty-year-old games it has at its disposal via licensing deals with Atari and Sega. Which is why AT Games is back—just a year after its last retro console launch—to release the Sega Genesis Flash and Atari Flashback 8 Gold. While these systems might ape the designs of their predecessors and the ethos of Nintendo, they’re still, at their core, cheap emulators crammed in cheaper plastic. That’s totally fine when it comes to the $60 Atari Flashback 8 Gold, but the $80 Sega Genesis Flashback has such a crucial flaw that you won’t want to invite it into your living room. AT Games launched way back in 2001 and has always been focused on producing inexpensive retro consoles. See, while Nintendo and Sony license and produce their own consoles internationally, Atari and Sega often licensed their consoles out to other companies. This became increasingly popular as demand for their systems waned in the US. The companies could make a quick buck selling Sega Genesis or Atari 2600 licenses. Acquiring these licenses and producing super cheap consoles has been AT Game’s strategy since the beginning. Over the last 16 years, AT Games has produced a LOT of inexpensive Sega consoles, and it hasn’t just released the consoles itself—it produces consoles for other companies too. The most notable being the Brazilian TecToy, which has been licensing the Sega lineup since the launch of the Sega Master back in 1988. There’s an actual slot for Sega games if you have the cartridges. Unfortunately, Sega and Atari seem to have no quality control clause in these licenses they sell, and consequently, AT Games has a reputation for making some... not great consoles. So let’s start with the Sega Genesis Flashback, as its really, really bad. It shouldn’t be! It plays 85 games hailing from the Genesis and Master systems, including musts like Shining Force, Sonic the Hedgehog, and Mortal Kombat. 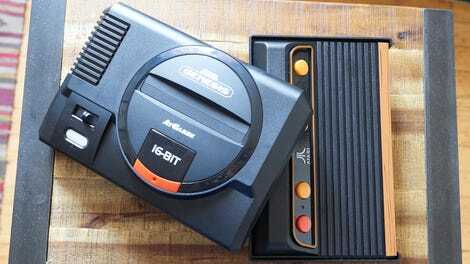 It also has a slot to play actual Genesis and Master cartridges, should you have any on hand. There are even some major upgrades from previous iterations of AT Games’ Sega console. First is the HDMI port allowing for up to 720p playback of games. While these aren’t really games that should be played in 720p (“Oh God I remember this being state of the art” my roommate moaned as she spied Sonic spinning across the screen), they’re still crisp and attractive. But the checker squared backdrop common to many Sonic the Hedgehog levels is nausea-inducing. As if there was just a hint of lag somewhere, slowing things down. The bigger upgrade is that AT Games finally fixed an audio problem endemic to its Sega systems. Sega games are kind of notorious in emulation circles for getting their audio screwed up easily (just watch the video to the left), and AT Games has struggled with the problem for nearly ten years. Between the fixed sound, the great looking replica chassis, and the system’s introduction of a rewind ability and save states, the Sega Flashback could be a great and affordable competitor to the discontinued NES Classic or the upcoming SNES Classic. But there’s a problem. See, AT Games elected to go with wireless controllers, while they handle well and have the more popular six-button Genesis layout, they’ve got some big problems that ruin the Flashback. First, the controllers require two AAA batteries to run and accessing the slot for the batteries requires a screwdriver. Second, and far worse, the controllers don’t work consistently. In my testing, it was always a tossup whether pressing a button would actually result in a corresponding action on screen. The Start and the C button were both pretty trustworthy, but every other button required repeated key smashes or brief and excruciating pauses. The Atari controller has that great bumpy texture live the original controllers. In a video game, especially from the 16-bit era when precision was the key to beating games, an inconsistent controller means death. A lot and lot of death. There are two ports if you happen to have original Genesis controllers on hand, but if you don’t want to go trolling through eBay for those, you’re stuck with the two 2.4GHz wireless controllers AT Games provides. AT Games also provides wireless controllers for the Atari Flashback 8 Gold. This system can’t play old cartridges, but it can connect to a TV with an HDMI port churning out 720p games. As with the Genesis Flashback, the Atari system also has the cool ability to rewind and replay the last 6 seconds (nothing like watching a brutal Pitfall death over and over again), and there are even ports if you have old Atari controllers, as well as a SD card slot in case you want to shove more Atari games on the console. As it already has 120 games available you probably don’t actually need that SD card slot. This thing has all the good games like Frogger, Pitfall, Missile Command, and Yar’s Revenge. Notably absent is Pac-Man, presumably because Namco Bandai had no desire to license it for a $60 nostalgia bomb like the Atari Flashback 8 Gold. 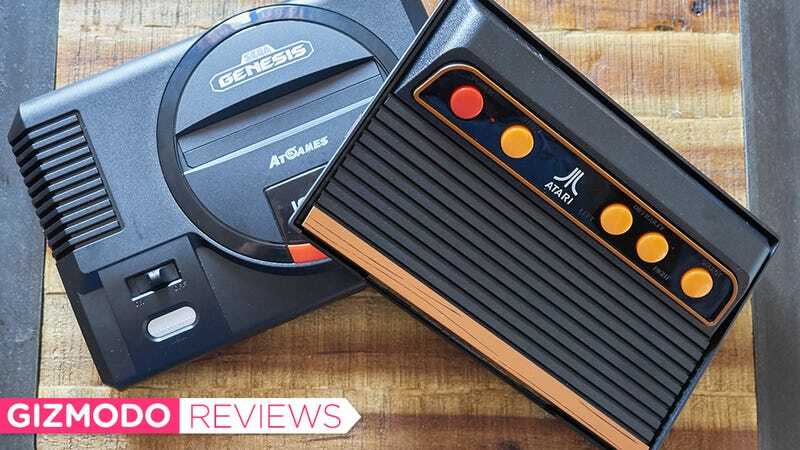 Of the two consoles the Atari Flashback 8 Gold feels much more worth its price tag. The wireless controllers work with aplomb and the joysticks handle even the most vicious jerking. The menu screen is also more visually appealing, with none of the discordant elements found in the Sega Genesis Flashback. Despite spending a better part of the 90s attached to a Sega Genesis it was the Atari—which I only encountered on muggy summer nights at my cousins’ in the 80s—that I keep finding myself flipping on and playing. If there’s a retro console war brewing then Nintendo might possibly have a contender with AT Games’ Atari Flashback 8 Gold. The minute you pick up the controller you seem to hear whiffs of Flock of Seagulls playing in the distance. When you pick up a controller for the Sega Genesis Flashback you just feel pity and confusion. Was the Sega always this bad or is it the controller? Either way, I have no desire to drop $80 on it. Particularly when it’s true competitor, the SNES Classic, is just around the corner. The $60 Atari Flashback 8 Gold is pretty great! The $80 Sega Genesis Flashback is not great. The controllers on the Sega Genesis Flashback don’t work consistently. But it does fix the sound feature, and both include a rewind function for skipping back a few seconds. UPDATE: An AT Games spokesperson tells Gizmodo, and other outlets, that the Sega Genesis units shipped to reviewers were faulty. We’ll update after we’ve had a chance to check out a new unit.